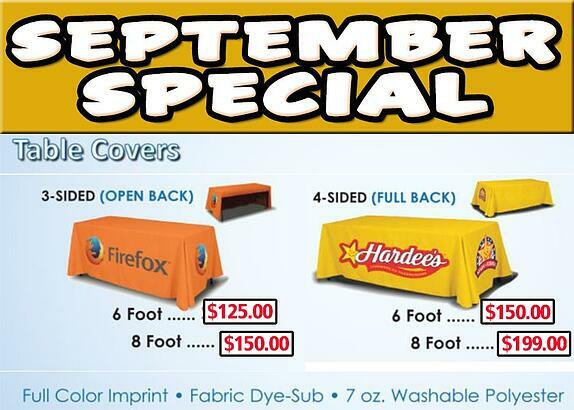 Check Out Our Special Savings on Custom Printed Table Covers! Fabric table covers offer your event exhibit a broad range of benefits. They are inexpensive to update, easy to use, and simple to transport. Many exhibitors are concerned about their display having scratched finishes or glare issues. This is not a problem with table covers. As if there were not enough reasons to choose these graphics, The Sign Studio is offering a September special on discounted custom printed table covers in Los Angeles. For the entire month, you can get special deals on three-sided and four-sided table throws with full-color imprints of your logo. We will examine this offer and how best to take advantage of it below. Also referred to as table throws and table runners, table covers are loosely draped over the table you are usually provided with at an event to transform it into a branding tool. We suggest using graphics and colors that complement your other display elements, like your typeface, colors, and logo. This will assist in building your brand awareness. We especially like table runners because they offer the ideal cover for the unsightly cardboard boxes commonly used to transport marketing materials from your office to a trade show. Just put them under your table, and event-goers will be none the wiser. What Is the Difference between 3-Sided and 4-Sided Table Covers? There are two main types of table covers: three-sided (or open back) and four-sided (or full back). Both have their advantage. The open back style makes it easier for people to sit at the table or to access items stored underneath. On the other hand, you should probably be too busy pursuing leads at trade shows to have time to sit. In this instance, a four-sided throw may be better. Both types can feature whatever graphics you want, are fabric dye sublimation printed, and are made of seven-ounce washable polyester. Since the three-sided cover uses less fabric, it is less expensive for our September special: six-foot covers are just $125, and eight-foot covers are $150. For the four-sided discounted custom printed table covers in Los Angeles, the prices are $150 and $199 respectively. But hurry! This offer ends 9/30/2016! Where Are Table Covers Used? Trade Shows – Most trade show booths make use of tables. It may serve as a spot for prospective customers to write down their contact information, or you may have displays and brochures available on tables. Be sure to use this space to show off your branding with table runners. Events – If you are hosting a corporate event, you can add a classy touch to your tables with distinguished table throws. Fairs – Are you exhibiting at a job fair? A state fair? Any other affair? Make your name stand out with table coverings! These are just a few of the ways you can put this visual branding solution to work for your organization. If you are interested in learning more, contact the friendly professional at The Sign Studio today for a free consultation.